Come the White-Yang Era, Holy Teachers reincarnated as humans for deliverance. In 1930, Shi Zun and Shi Mu were heavenly mandated to spread the Tao in China; within decades, Tao has globally spread. The Tong-XingTemple (Tianjin City), the origin line of the Fa-Yi Division, was one of the Tao temples mushrooming in China. Back then, Laoqianen Han was ordered leading a missionary team to Taiwan for reviving Confucianism. In 1947, Qianren Chen set foot Taiwan. Though parting from parents, she compensated it with fruitful propagation. (Tao community) With a mere 5-6 volunteers leading 5 Huoshituans by holding 13 Tao study classes all out each week, their Tao development grew leaps and bounds in two years. Later, another public temple “Zhenghua” was set up, so it was an extra morale boost. Unexpectedly, their Tao Dissemination was hindered by government crackdown and wrong media reports in August, 1980; the public shied away from their Tao temples and their morale was at an all-time low. *Wide-Giles: Chuang Shengt’ang, Shih Pochen & Li T’aishan . *Huoshituan: a self-catering team/group or a boarding place in vegatarianism. 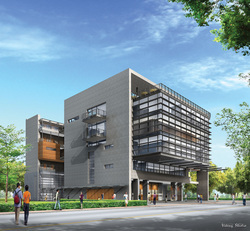 Zhenghua (Chenghua). When the going gets tough, the first-ever community-style big public temple was built in the Chong-De Sub Division; it’s officiated by Laoqianre Han and Qianren Chen, 19/10/1987, with high turnout. Gaining momentum, at least 14 public temples and 80 plus house(family) temples, under the “Seven Lines”, were set up one after another over the years in major cities and towns in Taiwan. At the end of 1987, Tao propagation in Japan was initiated and so it was the start of overseas Tao dissemination; after few years, a Tao temple in Taipei “Huade”(Yeide) was set up by the grads returned from Japan. And Master ShiboZeang was the one took the charge. Master Zhuāng was ordained 1989 and retired 1990 due to the steady overseas Tao growth. He’d been living abroad for 10 years most of the time supervising foreign Tao affairs, while Master Lǐ took charge of home Tao affairs with the help from Master Zēng and Mr. Lín, a Tao lecturer. Huade (Huate); Zeng (Tseng). Sadly, the Chèng-Hé Temple had to be demolished by government expropriation in 2000, but a piece of land was “compensated” by Laomu (the Almighty); Senior Master Hán Wànnían* was invited to lay the foundation stone, 2005, and the foundation work was started 2007. During the construction of the new Chèng-Hé, involving selflessly was construction workers, fundraisers, specialists, bakers, etc. Contributing to this reconstruction, various donations and loans were received from both home and abroad, such as interest-free credits, mortgage collateral, disposals of valuable jewelry, donations by parental names, etc. Years passed, the reconstruction is finally completed; it also makes us joyously forgetting the sweat over the years, *Wannain(Wannien). The daughters of the Huangs furthered their studies in universities in Japan, 1987; Senior Master Lai officiated at the Jinde Temple in Japan, 1988. Under persuasion of both Huangs, many Taiwanese grads in Japan pledged to spread the Tao after returning home. Overcoming the gaps of cultures and languages, few Chinese permanent residents are recently trained for roping in Japanese followers. To date, 2 temples and a couple of domestic temples are set up. For a long-term plan, Master Huang Meizhi* is stationed there. From 1993 on, under the Japanese line of overseas Tao expansion, a number of public temples were set up one after the other, and they’re Tóng-Qìng, Tóng-Yì (both are in Pinang), Ān-Dé (Ipoh), Bó-Dé, Jǐn-Dé (both are in KL), Hé-Dé and Jùn-Dé (both are in Singapore), and they’re in operation to rule with the central Tao affairs. The *Changde Temple in Hong Kong was set up in 1998, still led by newly promoted Master Augus Chan. Besides monetary contribution, Mr. and Mrs. Chan have been busy roping in the talents both from local and mainland, so their Tao development outlook is bright. More importantly, “Changde” could be a stepping stone disseminating Tao in China in the future. *Meizhi(Meichih); Changde(Ch’angte). The late Master Líang Yǒng* once sojourned in Australia. In an Aussie Tao Assembly, he promised the Holy Teacher “to being a superior man through new places propagation” (in down under). Because of his promise, he even used whole life just for keeping his word. In 1989, Senior Master Lai officiated at the Liang’s House (family) Temple. Guided by Laì, Liang’s confidence grew stronger. Master Líang was a very helpful guy, even if minor things, thus pulling a whole bunch of people into cultivation. 1996, he sold off all his property for building the *Chǎn-Dé* Temple alone. Astonishingly, he was diagnosed having three cancers; as he left his life aside and very determined to Tao propagation, on Laomu’s mercy, he got his life extended and lived 10 more years, how amazing! Basically, Master Liang was so passionate about Tao propagation. Though his condition was serious and feet were tottering, he volunteered to help out at the temples in East Malaysia too, 2005, what a touching move! Gone by sitting coolly, 13/1/06, he attained Tao (salvation) and was conferred the Great Immortal *Chǎn-Dé. Now Master Liang *Yingrang (son) succeeds the late Master Liang Yong’s role. Also, Mr. Jimmy set up a house temple in Sidney; he does partaking in operational plans from the Aussie Central Tao Affairs. *Yong (Yung); Chan-De (Chante); Yingrang (Yingjang). Sister Huáng *Jīn Yì and *Yè Huì Zhū propagated Dao to Macau, 1992; one year later, Qianren Chen mercifully approved to set up the *Xíng-Dé Temple. Two years of efforts, Huang and Ye managed to build a firm propagation foundation there. Plagued by serious illness from exhaustion, Sister Huáng returned home 1994, and then Master Chaì Zhìchéng took over the baton. He had the guts; over the years, a cadre of female talents had been grown. Amazingly, they run their temples by breaking into divisions, and the results were phenomenal. Due to the growing numbers of the mainland workers, they also opened three classes within a day in day and night. The *Xingde Line now has a big temple and over 10 public temples led by both masters Luo and Liao; additionally, there are Chengde and *Rende temples set up by Master Huang, *Yong-Dé Temple is under of Zengyong temple. *Jinyi (chin I); Ye Huizhu (Yeh Huichu); Xingde (Hsingte); Rende (Jente); Chengde (Chengte); Yongde (Yungte). In 1995, Mr. Louis Loo pledged to spread the Tao in Kuching after returning from Japan. Owing to his sheer dedication, persuasion and follow-through, Tao base was firmly built there. In 1998, Qianren Chen approved to set up the Chéng-Dé temple. Out of the blue, Ms. Huáng Jīnye was at the Holy Teacher’s command stationing there for Tao propagation. Leaving her stable career and contributing in effort and money, she has no regrets for years of hard life. She was even willing to travel an 800-km round trip just getting people to I-Kuan Tao temples. Visited by Qianren Chen, the Tao affairs centre was formed in 2003. Based on divine help and commitment among other temples, Tao development was thriving there. In Dec 2004, a car accident almost took Huáng’s life with multiple bone fractures, notably her neck vertebrae, but Laomu gives her a second life. Upon her full recovery, she resumed her post in Tao community, and her miraculous comeback is akin to the “return for great vow”. In 2013, she is ordained a Tao Transmitting Master. Presently, there are 3 big temples (Chéng- Dé, Jìn-Dé & Rén-Dé) and more than three public temples (Zhōng-Dé, E̅n-Dé, Hede and so on) and over 10 housefamily temples. In 1999, being a helper in missionary works at first, Master Huáng Jīn Yì soon became the caretaker leader. Fearless of civil war and poverty, she’s fated to be in Nepal. She loves the land and people there, and feels for the plight of the Nepalese. Though putting money and efforts, she has no complaints at all. She, too, was hit by a spate of trouble; however, she often hid her distress from the family and Tao seniors, but she rather often cried before the altar alone. Owing to her dedication, Laomu finally sent in a batch of temple juniors for her; they’re her loyal and devout peers; with their blood, sweat and tears, the *L.B.W.I. E. School and the Chang-He Temple are set up. Now, nearly a thousand kids and teachers in this school go vegetarian. Since it’s the only school promoting moral values, its name is spread far and wide, paving the way for propagation to South India in the future. 2013, Master Imelda Lao is ordained a Tao-Transmitting Master, hence opening up more propagation opportunity in the English-speaking countries. *Lord Bright Wisdom International English School. 2009, Master Caì spread Tao into Vietnam and Cambodia; meantime, Master Lǐ Taìshān also spread Tao in Cambodia in 2010. 2011, the Cambodian Chóng-Dé Tao Affairs Centre is officially formed; Senior Master Lai officiated at both temples, Xingde and Rongde. Working hand in hand, both temples are holding a few Mandarin teaching classes for pulling in new followers. Considering Huoshituans of both temples followed by a great bunch of university students, both temples have a bright future, so are the university students in holy and worldly affairs. To avoid a Tao fieldcommunity for withering away, also providing the stage for new blood and talents, the 3-3-3operational mode is essential. In this system, the manpower of a public temple is split into 3 divisions at least; each division has to form 3 sub-divisions of follow-through at least, and each division’s goal is to form another public temple. Each sub-division is functioning independently for further expansion and follow-up jobs. If the three divisions have successfully upgraded to a public temple, the existing public temple would grow triple. Years passed, all units will keep growing with the same operational mode. In 2004, “expansion by divisions” was tested on propagation; generally, it was found that division chiefs had firmer stands and were willing to undertake more holy affairs. Not only they dared to overcome bottlenecks, but they also run various teams and programmes like in setting up temples in a new place. Despite splitting into divisions, they were a united team and helped each other for Tao development. Thanks to Laomu’s blessing and everyone efforts, on the past few years, the number of public temples as well as Tao development from both home and abroad marked significant growth. Through training and practical experience, prime movers of propagation were slowly trained to be more independent-minded; having sufficient substitutes, the “system of substitution” can also ensure the smooth operation in holy affairs. Instilling the “Purpose of Tao” and realizing the Five Core Domains as clear goals, the Maitreya Paradise is gradually brought on earth. (1) Families of filial piety and sibling love: in making a blissful life, cultivators have to equip themselves with filial piety, siblinghood (brotherly/fraternal love), complete morality and the Five Bonds of Human Relationships with them same mind. (2) Scriptural education: understanding classics and sutras via recitation, practicing its moral values in daily life, edifying oneself with propriety and music (the Doctrine of the mean), one’s life will have Tao which is closely connected with sage character. (3) Toxin-free lifestyle: In view of our future generations, everyone is urged to go green, care for every living being and our ecosystem, and practise a toxin-free, simple lifestyle. (4) Grateful towards life: instilling the right view and right mindfulness for ups and downs in life with gratitude and mentality shift. (5) Eternal life: understanding the law of karma, watching our every act and developing a healthy body, mind and soul, cultivators are striving to accumulate merits until attaining ultimate sagehood. In 1996, the Maitreya’s Day was first introduced. To meet the need of Tao development, a few activities are organized, such as lifelong learning & parent-kid scriptural recitation, Chinese Orchestral bands, leather drum bands, ukulele bands, mama’s classrooms, etc. With the participation from the old and the young from both Tao members and non-members, the academy is a house full of laughter. Prof Wang Caigui was urging for sutra recitation on kids in1995. In 2003, in accord with Tao development in community areas, parent-kid sutra recitation classes were actively promoted with high praise, therefore pulling in a high number of new believers, followed by setting up many temples in various places, and this successful concept was later promoted abroad. In 1999, Lee brothers introduced the sutra recitation day care centre “Chóng-Huá”. In 2009, the academy team established the Guangming Kindergarten; the main focus of the kindergarten was on scriptural recitation, while its secondary focuses were on character, art and physical education. On promoting a toxin-free lifestyle, the kindergarten does providing organic meals. Currently, the academy is holding several day care centres, Guāng- Míng, Aì-Xīn, Zhèng-Dǐan, Zhengchang and so on. In 2005, almost all divisional teams of the academy formed the “School Voluntary Squads” one after another. These squads were training young students in giving help in studies and morals for the weak school kids; the squads do render help for the weak community, especially the welfare organizations. Now, the academy has over 30 school squads and more than 10 charitable societies; school squad volunteers and counseling students are totaled over 1000. In fact, squad volunteers are very beneficial for life during both training and serving time. All the above activities have gain recognition from various quarters, and its leaders were consecutively awarded praiseworthy certificates by government agencies each year. With the blessing of Laomu, Baishui Shengdi (Laoqianren Han) and Bodhisattva Buxiuxi (Qianren Chen), and help from all the I-Kuan Tao members, the academy’s management team can enjoy such achievement thus far. A passage in the Analects of Confucius: Only when succeeding someone (the great one) ambition and keeping their noble undertaking moving forward can another be entitled a “great person of filial piety”. In returning for the grace of Laomu and Holy Teachers, in future every cultivator not only has to be gratitude for patriarchs and the Tao initiators of qianren’s generation , but also to their dedication, emulating their great spirit of propagation and inheriting their distinct virtues. Though the academy’s completion is worthy of celebration, the management has to work even harder getting monthly mortgage payments ready. Responsive to “the continuation of generation-to-generation Tao heritage”, all fellow cultivators must have a total awakening of propagation commitment, wholeheartedly realizing the Five Core Domains and inculcating the Tao tradition of simplicity, bringing the Maitreya Pure Land to reality on earth. On the academy’s future, besides enriching Confucian virtues, its key figures are required to be more independent by having multi-skilling and willing to undertake more holy jobs; every temple also has to apply “expanding by divisions” for the steady Tao growth at grass-roots level. Holy Teacher Jigong mercifully said, “Life has an end but the passion of propagation and salvation has no end; death has a definite date but extending love, sympathy and generosity are no definite date.” Looking forward to robust Tao growth and the “Tianming” (Heavenly Mandate) in perpetuity, we ought to help our Holy Teacher for propagation and the sustainability of the Chongde. We pray for Laomu’s blessing that our eventual visions of spreading Dao in Taiwan, China and the world will come true. In the future, we wish to see all the temples either from home or aboard spreading Dao into China or foreign countries, going down in the history books of the White-Yang Era.